Figure A. Alexa Fluor 700 conjugated Mouse anti Human CD3 (MCA463A700) and purified Mouse IgG1 isotype control (MCA928) detected with Goat anti Mouse IgG PE (STAR76PE). 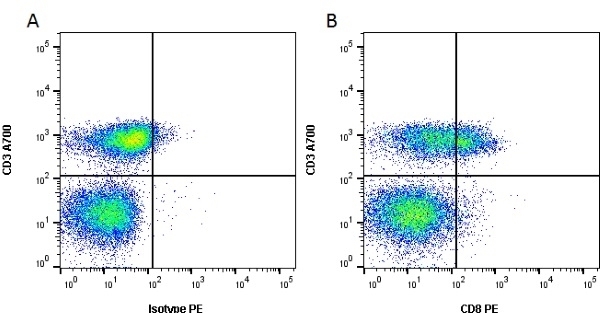 Figure B. Alexa Fluor 700 conjugated Mouse anti Human CD3 (MCA463A700) and purified Mouse anti Human CD8 (MCA4609T) detected with Goat anti Mouse IgG PE (STAR76PE). All experiments performed on red cell lysed human blood gated on lymphoid cells in the presence of 10% human serum. Data acquired on the ZE5™ Cell Analyzer. Mouse anti Human CD8 monoclonal antibody, clone RPA-T8 recognizes the alpha-chain of the human CD8 antigen, a ~32 kDa single pass type 1 membrane glycoprotein containing a single Ig-like V-type domain. CD8α forms either homodimers or disulphide bond linked heterodimers with the CD8β chain. CD8 is expressed by thymocytes, the cytotoxic-suppressor subset of T cells and weakly by NK cells. CD8 functions as a receptor for MHC Class I molecules. Use 10ul of the suggested working dilution to label 1 x 106 cells or cells or 100ul human whole blood. inLeukocyte Typing IV, White Cell Differentiation Antigens, edited by Knapp W, Dorken B, Gilks WR, Rieber E, Schmidt RE, Stein H, Von Dem Bome AEG, Oxford University Press: pp 475-8. Suranyi, M.G. et al. (1991) Lymphocyte adhesion molecules in T cell-mediated lysis of human kidney cells. Kidney Int. 39 (2): 312-9. Aversa, G. et al. (1994) A monoclonal antibody (A6) recognizing a unique epitope restricted to CD45RO and RB isoforms of the leukocyte common antigen family identifies functional T cell subsets. Cell Immunol. 158 (2): 314-28. SanSebastian, W. et al. (2013) Adeno-associated virus type 6 is retrogradely transported in the non-human primate brain. Gene Ther. 20 (12): 1178-83. Samaranch, L. et al. (2014) AAV9-mediated expression of a non-self protein in nonhuman primate central nervous system triggers widespread neuroinflammation driven by antigen-presenting cell transduction. Mol Ther. 22 (2): 329-37.